^ I've had cats in the house, it was a live-in GF's idea. A different kind of pet love...but just as good as dogs. A full screen view of the demise of my on screen sig-nature. An actual picture of a snake eating a toad here on the aka ranch. Mama took a video of this critter, she thinks it's an Otter. Looks like a big old beaver to me. I thought it was a rat when I first saw it. It's bigger than a muskrat and it doesn't have a rat like tail. It's not exactly a flat tail either. At first glance I thought it was a big rat. M*A*S*H shoulda been called The Alan Alda Show. I heard the reason why Wayne Rogers and McLean Stevenson left the show was because they felt like it was focused too much on Alan Alda's Hawkeye. I never cared much for him in that role. Yeah, I think he was often given credit with producing and writing some of the episodes. It was a much better show when Harry Morgan, B J and Winchester stole some of the lead lines. I definitely agree re: Harry Morgan/Potter and Winchester. Never was much of a BJ fan either, though. Well.... not THAT particular BJ, anyway. This may be disturbing to some viewers. If you didn't see the story, the Bald Eagle attacks and drowns the Fawn. Pulls it onto shore, and returns to feed on it for the next 3 days. I saw this big bird sitting on our porch swing, Mama took a video of it. What is it? It has a face/head kind of like an owl, but it seems too big to be one. From her facebook post, the easiest way for me to copy an image. His head/neck area seems too thick for a hawk, but I guess it could be all hunched up. I'm no expert on birds, she might be right. Talk about a snail trail, yuck! 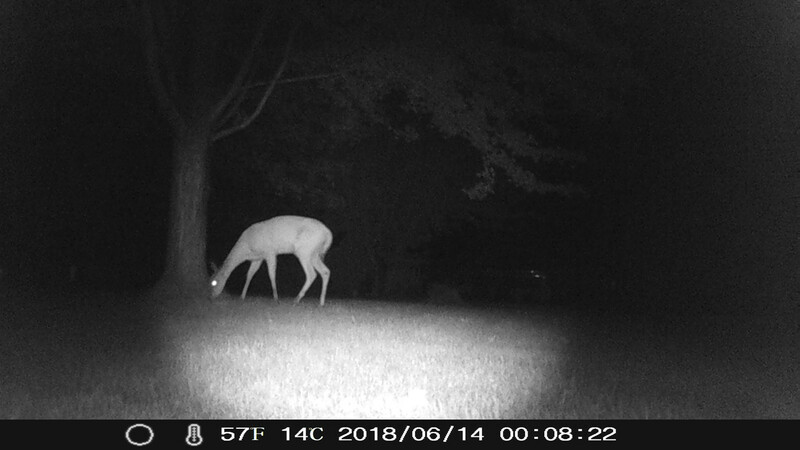 ^There were actually 3 deer crossing the back yard yesterday evening. I'm not thrilled with the pics from the Critter Cam, Mama just took this pic. I don't remember seeing a duck ON the fence before.